To the Editor: The centile chart currently in use for Western Cape birth weight for gestational age covers a gestational age range from 28 to 42 weeks.1 Advances in maternal, fetal and neonatal medicine allow interventions prior to 28 weeks; a growing need therefore exists to extend the chart down to at least 24 weeks. Birth or fetal weight centile charts used in the USA, Canada and the UK provide centiles commencing from either 22 or 24 weeks.2,3 These charts may not, however, be appropriate for the population of the Western Cape.4 The accuracy of fetal or birth weight for gestational age centile charts can be improved by including only women who had their gestational age confirmed by early ultrasound prior to gestational age of 24 weeks.5 In addition, the birth weight of preterm delivered neonates should not be used to establish a norm, as these infants were delivered following maternal and/or obstetric complications.5 The ultrasonic estimated fetal weight (EFW) is the method of choice to establish a reference range for weight for gestational age in early gestation.6 The EFW should be used in preference to any single ultrasound measurement as it relies on multiple measurements.6 The aim of this study was to construct a centile chart from 24 to 27 weeks for fetal weight for gestational age, taking the above criteria into account. A cohort of 246 women with singleton uncomplicated pregnancies and early ultrasound-confirmed gestational age was recruited from the community antenatal clinics in the Tygerberg area (Elsies River, Bishop Lavis, Bellville South, Delft and Belhar). Sequential patients complying with the inclusion criteria were included in the study. The patients were referred to Tygerberg Hospital for ultrasound fetal weight estimates, using the Hadlock formula with the ANTARES (Siemens) ultrasound equipment, by a limited number of skilled ultrasonologists.7 Each patient had 2 ultrasound weight estimates: about half the cohort at 24 and 26 weeks, and about half at 25 and 27 weeks. 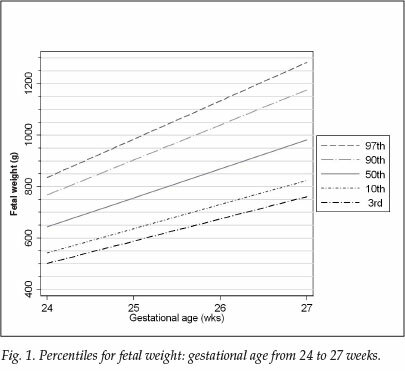 Accurate sequential fetal weight estimates provided the database for calculating the centiles in this gestational age range. Additional demographic information for each patient was collected, taking care to record information that may influence fetal weight, e.g. parity, smoking and body mass index (BMI). The patients were followed up until delivery and the outcome of the pregnancies was determined. A total of 246 patients were included in the study, presenting a total of 459 fetal weight estimates that contributed to the centile chart (Fig. 1). The ethnic make-up of the study sample was 224 (91.1%) coloured, 20 (8.1%) black, and 2 (0.8%) white. Thirty-three women had only one fetal weight estimate, values were missing for the smoking status of 2 women, and 39 women for whom weight and/or height at the first antenatal visit were not recorded, were not available for determining their body mass index (BMI). The median age was 23 (range 14 - 41) years, median gravidity was 1 (range 1 - 6), and median BMI was 24.7 kg/m2 (range 16.9 - 43.6). Labour was induced in 26 (10.6%) patients, and the mode of delivery was normal vertex delivery in 210 (85.4%), caesarean section 29 (11.8%), assisted deliveries 5 (2.0%), and breech deliveries 2 (0.8%). The median gestational age at delivery was 39 weeks (range 29 - 43), the median birth weight 3 070 g (range 980 - 5 120) and the median 5-minute Apgar score 10 (range 5 - 10). Of the subjects, 38.5 % acknowledged smoking during pregnancy. The percentages of male and female infants was 49% and 51%, respectively. There were 3 intra-uterine deaths (IUDs) and 1 early neonatal death, with a perinatal mortality rate of 16 per 1 000 deliveries. The primary causes of the 3 IUDs were a cord complication; acute pyelonephritis, vomiting and dehydration in a patient admitted with an IUD; and a stillborn baby delivered elsewhere, with no further information able to be obtained. The early neonatal death (day 1) was caused by a congenital abnormality. The infant had dysplastic kidneys that resulted in severe oligohydramnios and hypoplastic lungs. Pregnancy centile charts may be customised by characteristics such as maternal race, age, BMI and parity.3,10-12 The aim of this confined study was, however, to produce a single 'hard copy' fetal weight chart to be used in hospitals and clinics that do not have immediate access to the computers and software that would be necessary to implement customised charts. We noted further that the women in our sample, who are representative of the population served by Tygerberg Hospital, are predominantly of the coloured group. We constructed centile charts for the coloured group alone, but these centiles were not distinguishable from the estimates based on the entire sample (data not shown). Knowledge of centiles for fetal weight at earlier gestational ages will contribute towards more accurate decisions late in the second trimester. Furthermore, when gestational age is unknown, the ultrasound estimated weight could be plotted on the centile chart to estimate gestational age. Smoking affects fetal weight at an early gestational age.